Tamera is a 50+ blogger who loves to inspire women through the beautiful photos on her blog and the principle of crowning yourself and celebrating the truly unique person that you are. Time to find out more about this concept and this fascinating woman. I am a lifestyle blogger and fashion accessory designer. I will be turning 56 this March. Can you tell us a bit more about your blog Tamera Beardsly and why you created it? My blog began as an online journal of sorts and has morphed into a Lifestyle blog … where I celebrate the beauty in my everyday. I began my blog when my daughter left for college. After being a devoted full time mother … I could see my nest of three children begin to empty … and I had no idea at that time who I was … or where I wanted to go with my next life chapter. It was through writing my blog that I reinvented myself and rediscovered my passion for my previous career of designing fashion accessories. You recently introduced the principle of crowning yourself. Can you tell a little bit more about this? 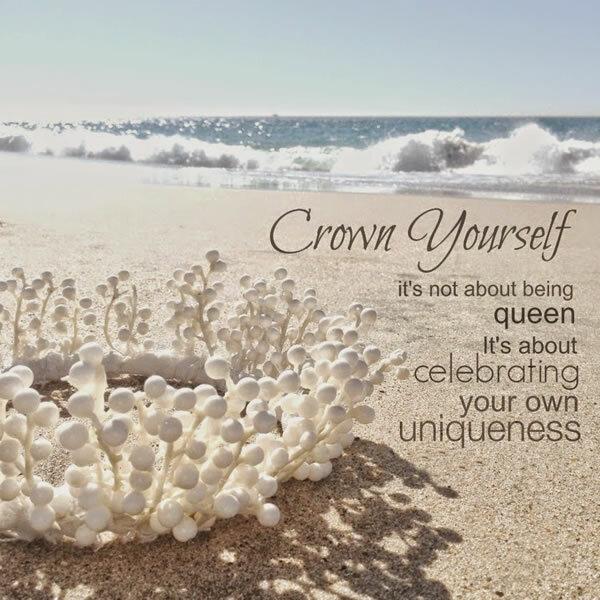 Crowning Yourself is my mission to inspire women … to take the time to celebrate what makes them unique. Over the past several years I have realized the importance of not only self care and self acceptance, but also the value in celebrating what makes each of us unique. 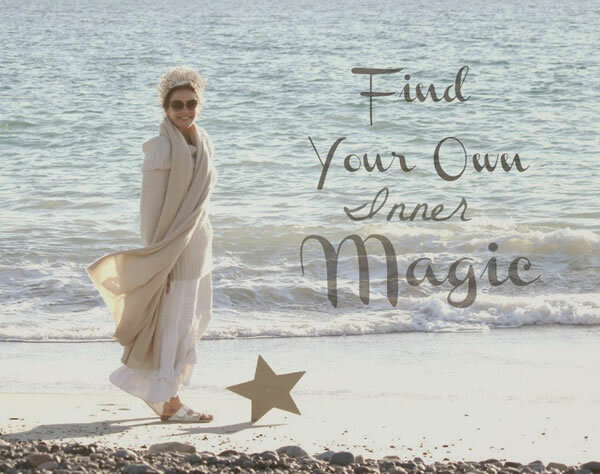 I believe the more we can learn to value and relish in our own inner magic … in turn … the more we will be able to celebrate and nurture others! Why do you feel that crowning yourself is important and how can women do this? I believe we nurture others best, from our overflow of heart. When we can Crown Ourselves … with self respect, self care and the true grace of personal self acceptance … the ripple effect will be an automatic offering of these to others. Besides the literal wearing of fashion crowns, I believe woman can Crown Themselves in a myriad of ways. I think any time we can pause to recognize the good we do, is one simple act of Crowning Yourself. I believe any type of self care is a Crowning moment. Every morning I have my coffee with candles … before the sun comes up. I take this time to savor the moment and reflect on my gratitudes for the day and the good I have done for others. Beautifying my space, buying myself weekly flowers, having alone time, dressing myself well … are all ways I Crown Myself … and remind myself … I Matter. What inspires you in the creation of your crowns? I get inspiration for my crown everywhere and for all sorts of different occasions. My favorite crowns are ones I do to celebrate an individual women! I have done crowns for women … young and old …and everybody is always inspired to stand a little taller …and enjoy their Crowning Moment! Can you tell us a little bit more about how you actually create your crowns? Most crowns I start with either a wire base or even a headband base … and the creativity in materials takes off from there. I have even worked crowns into parties! For my daughter’s 22nd birthday I bought sparky chenille pieces and feathers,so everybody could make their own crowns! It was a huge party success! 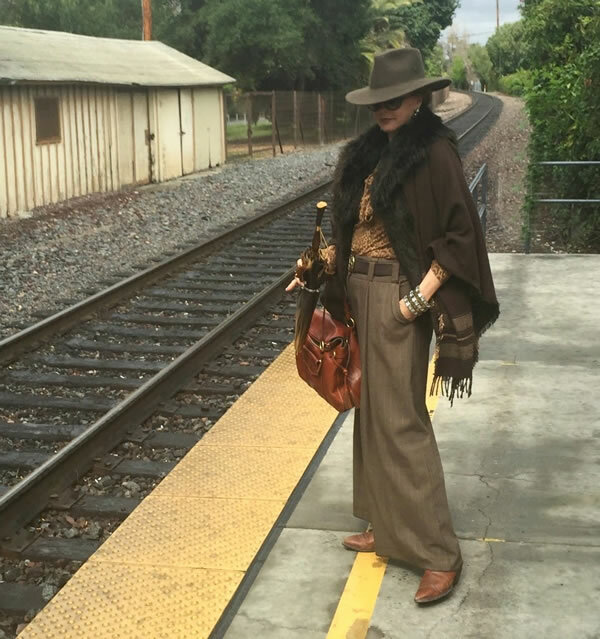 My own style is a mix a of Southern California boho beachy vibe meets Old Hollywood Glam. 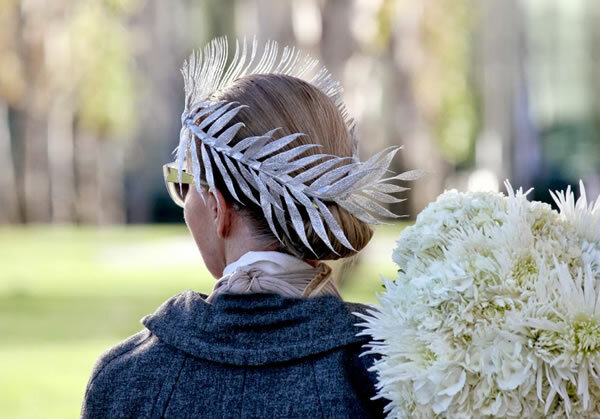 How do you incorporate your crowns into your style? I am able to do crowns for individual outfits and occasions. I first started wearing crystal crowns I made for New Years Eve. One of my favorite crowns I made was for a birthday party I threw for myself … if there is ever a day to Crown Yourself … a birthday is the perfect occasion! The most important components of my style are definitely accessories! It was my strong love of accessories that led me to a career designing them. Before having children my company was very successful and was covered by the likes of WWD as well as my pieces being used in movies and TV. Accessories can add immediate style and personality to any look! I live in Southern California and this influences a certain sportiness into my glam pieces. The weather where I live also plays a big part in the choice of wardrobe pieces. I would say it would be big glam sunglasses with a hat, turban or crown of some sort and a finishing of bold accessories. How I feel in what I wear is always the inspiration. Whether it be a feeling of dramatic spender or a simple sporty chic style … it is always about the mood I’m in. I am usually drawn to color choices depending on where I am going and the occasion. My body type is always a consideration when I choose my wardrobe purchases. By this time in my life, I know which body areas I want to highlight and down play. My style has actually gotten much better as I have aged. When I turned 40, I was a mother of young children, who I always dressed beautifully, and what I wore was almost a secondary consideration. Now that my children are grown I have had the time and reignited passion to once again put creative energy into my personal wardrobe. For me dressing ‘age appropriate’ means dressing my authentic self. I would never say no to a trend as long as it highlighted a positive attribute of my body and made me feel happy. On the flip side I would never intentionally try to dress to ‘appear younger’ than my age. I am quite proud of being almost 56 and feel no need to dress to conceal my true age. I think dressing age appropriate should only be about looking and feeling your very best! That is an easy one! At this stage in my life I am actually much more interested in fashion and style. Not only do I have more time and money to participate in both, I know myself a lot better and revel in my own inner magic and creativity! The way I look is important to me because dressing well and creatively brings me much joy. Dressing is a creative outlet for me as well as a way to showcase the pieces I create. When I have on an outfit I love … to me it is a perfect example of Crowning Myself. It gives me joy and confidence and in doing so frees me up to have more confidence to truly relish in the magic and uniqueness of others. WhenI feel good about myself, I have ever so much more to offer others. I have many favorites all for different reasons. But right now I would have to say my brown maxi, fur vest and winterberry crown would be up on the top of my list, as well as my cream maxi skirts and fur vest. I am loving a long silhouette these days and I always love some fur to finish a look. I like to be aware of trends as I am always looking for fresh options to update the pieces that I already own. Right now I am very much enjoying a wide legged crop pant with ankle booties. I have also been giving jumpsuits a try as well. Yes, the first tip I would say … learn to say kind, loving, and accepting words about your body in your own inner dialogue. Second, it is ever so true, that a smile is the best accessory. After that, be willing to try new looks … if even just in the dressing room. Also, before I shop for a season, I like to look through magazines and pull out what speaks to me. Not only does that train your eye to see what’s newly offered, but it gives you an intentional list to work with when shopping … which always works out better in the end. My plans for my blog are to keep the real person transparency in my writings and add in new features to inspire women to appreciate their own inner magic and uniqueness. I want to inspire women to Crown Themselves. This is my favorite post about Self Care during difficult times. Self Care is one of the foundation concepts of learning to Crown Yourself. Sylvia I would very much like to thank you for your interest in my Crown Yourself mission! I think this is such a great time to be over 40 … as the community building and revelling in the gifts to be found in aging, empower us all! Some wonderful wise words from Tamera. I hope you practice some of her valuable tips! If you like the idea of crowning yourself but feel like a crown does not suit you, Tamera also created beautiful crowning bracelets. If you like to order one, 40+ Style readers will get 25% off with the code ‘Crown yourself’. Lots more inspiration can be found at Tamera Beardsly! How do you like to crown yourself? Tamera speaks and looks so positive. She actually glows 🙂 I love what she says about speaking nicely to yourself about your body – that makes so much sense. Thanks for sharing her with us Sylvia. I also have the fabulous Tamera featured on my blog today…and you can win one of her CROWN YOURSELF bracelets…hope your audience will stop by to enter! I absolutely love this feature and I absolutely adore Tamara Beardsley. She is such a generous, warm and authentic woman and the metaphor of crowns suits her so perfectly. She is regal, brave and honest and that is reflected in her writing, how she styles her clothes and how she wears them in her world and in all her roles. Her self-aceptance is contagious. I am inspired by her all the time. So very inspirational. I love how Tamera finds MORE style, not less as she gains years. 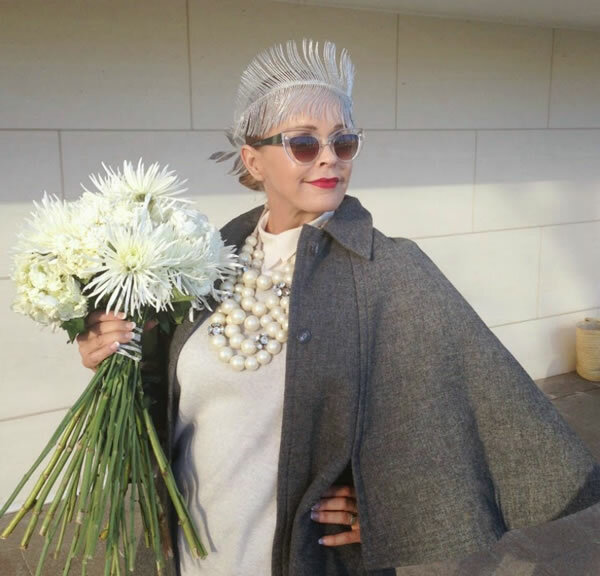 I’ve had a long career as a style and wardrobe consultant and many of my clients are now over 60 and 70. It’s so exciting to help them stay modern, happy and visible! I loved Tamera’s response to trends. She stays informed about them and then selects what resonates or finds it in her closet. So happy to have read this this morning! Thanks Tamera and Sylvia! Tamera doesn’t only have a unique individual style but I can also see her inner beauty through her posts, her Instagram photos and her warmhearted, extremely kind comments. I love blogging and social media for that reason – to meet wonderful women! She described her style as “Southern California boho beachy vibe meets Old Hollywood Glam” and I think that is so true! I wish I was living in a similar climate and I am sure my style would be different to my current one in a cold mountain environment. Thank you so much for featuring Tamera here, Sylvia! A lovely interview, Sylvia. I intend to check out Tamara’s blog. Her message to celebrate yourself is very inspirational. Wonderful feature! So enjoy Tamera’s inspiring and creative vision. 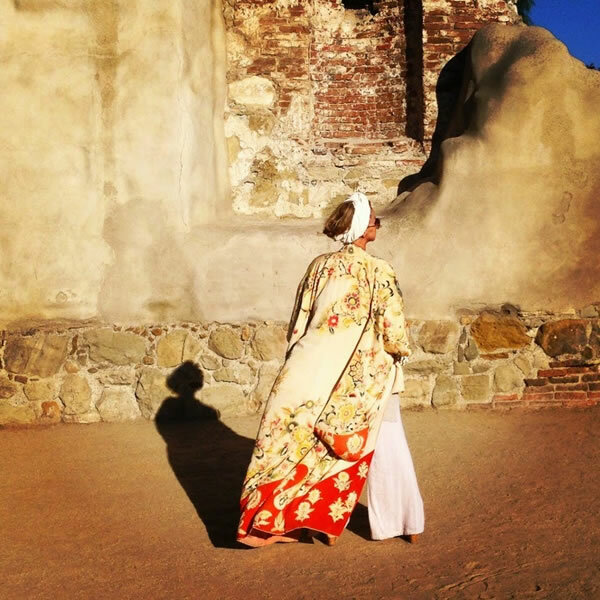 Great pictures and her style captures that California vibe with spirit and exuberance. Tamera is an absolute film star, she just naturally exudes style and is such an individual. Previous post: Having FUN with fashion in winter with a colorful winter coat! Next post: Remixing my clothes: cropped wide pants with colorblock top.